Have you been wondering what the rescue team has been up to the past couple weeks? I'll give you a hint...turtle, turtles, and more turtles! 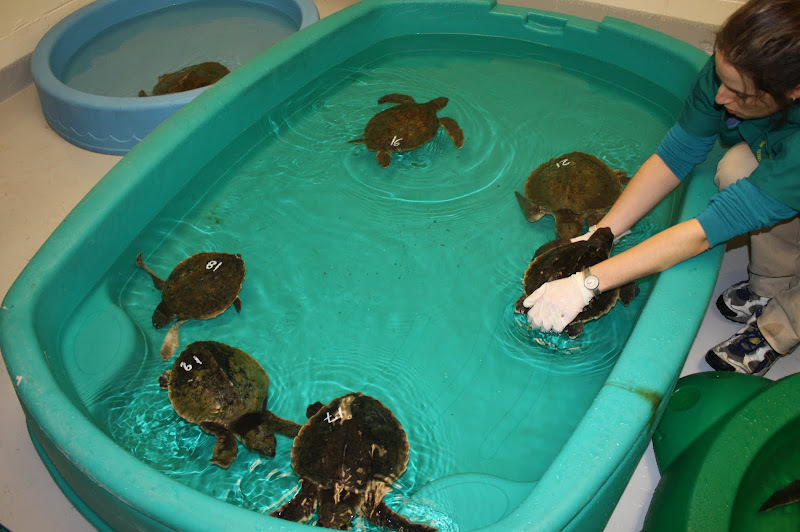 The 2010 turtle season is in full swing keeping our days busy with swimming them in kiddy pools, feeding, treatments and much more. The photos below show just some of our patients in kiddy pools and our isolation tanks. We even have 4 green sea turtles now. 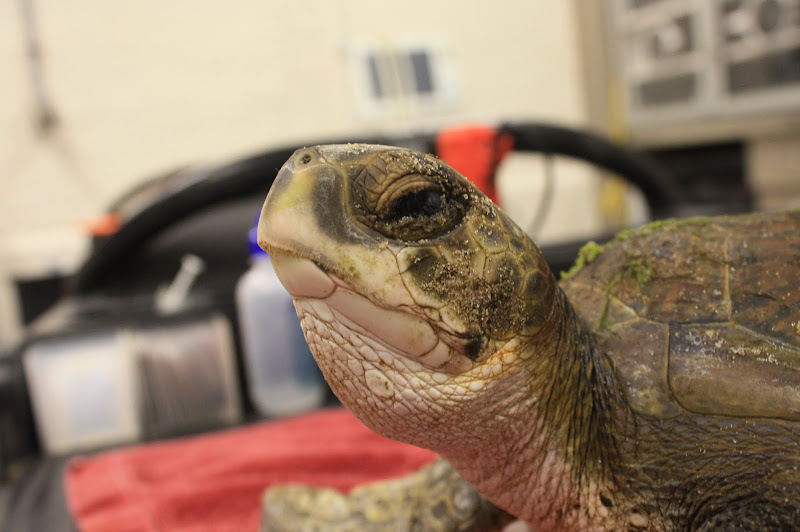 Below is a picture of the first green sea turtle of the season, Hercules (#13), during his intake exam. You may remember from the past that we like to satellite tag green sea turtles to see what path they take when they are released. We are hoping to do the same for at least a couple of our greens this summer. Maybe they'll lead the same path as Goose, who is still transmitting for over a year now! The map below shows Goose's most recent location. You can continue to follow him on seaturtle.org. I'll leave you now with a pop quiz on sea turtle identification. 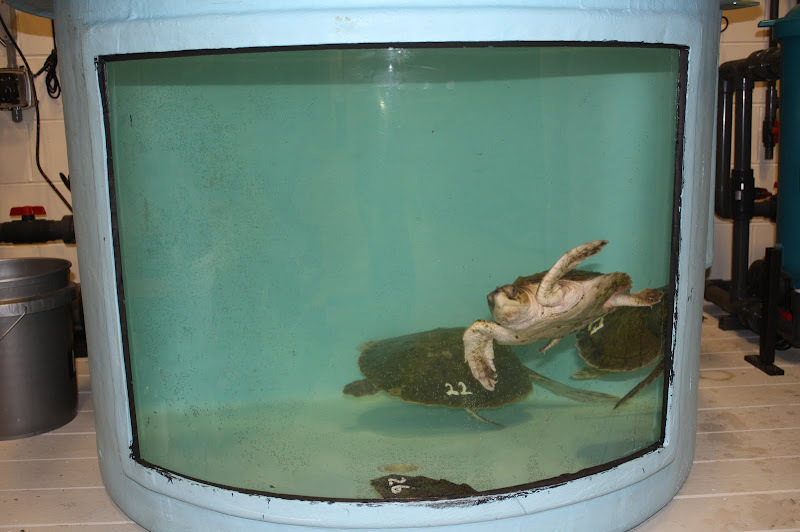 The photo at the beginning of this post has a green sea turtle swimming in a kiddy pool with Kemp's ridley sea turtles. Can you spot which number he is? That handsome Cm is number 16! Keep up the amazing work R&R!